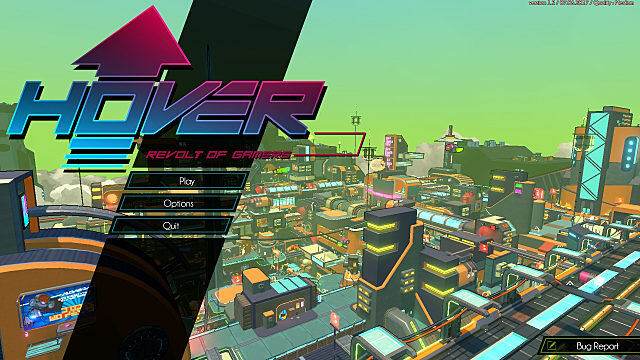 Hover: Revolt of Gamers thrusts players into the heart of an open-world dystopian city where fun and entertainment have been outlawed by a tyrant called the Great Admin. Two resistance groups known as the Gamers and Breakers are rallying together to protest the new laws the best way they know how -- by having ludicrous amounts of fun. The Gamers have recently captured a cloning chamber, and your team is next in line to take full advantage of it. As a clone, you'll have access to a Hoverheat Energy Gauge to fuel all the crazy running, grinding, and jumping you'll be doing to get around the city. In fact, that's pretty much the point of the game -- freerun around Hover City and have a hell of a time. Maybe challenge yourself to a few missions and progress the storyline. It's all up to you. You're not even locked into a linear level (tutorial aside) until you go to face off against the Admin. So if you're a fan of ideals like freedom and exploration and showing off your slick moves, you really need to check out this game. The controls feel clumsy and almost unwieldy at first, like trying to walk after growing a brand new pair of legs. Don't go blaming the game for missing your jump for the umpteenth time, though. It takes a lot of time to really learn the controls, but when you do, it's a joy to zip around the city in style. They're pretty simple, too. 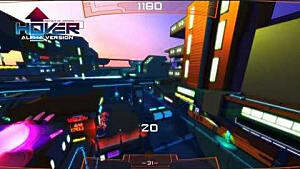 Hover uses traditional 3D movement controls for both character and camera, and I wouldn't have it any other way. The jump key is pretty standard. The longer you press it, the higher you jump. Additionally, jumping right when you hit the ground from a long fall lets you bounce, carrying on whatever momentum you had from the fall. The grind key is hugely versatile, allowing you to grind on rails, slide on floors and walls while in motion, and perform tricks when used in conjecture with jumping. Finally, the rewind key allows you to return from whence you came. Note that it just takes you back to where you were before, it doesn't rewind time or undo your last actions. And if you try to rewind while holding something, it'll simply drop. Tied together with expected functions like the interact key, a menu, or a U-Turn, the controls are simple yet astoundingly exhilarating in practice. When I really got the hang of them, I leapt across the city -- gleefully giggling at the wonderful time I was having. It's weird to say it about a game with no fighting or combat system to speak of, but I felt truly powerful in those moments where the controls just clicked. It can be a struggle to learn the controls, though, if you don't have a direction or anywhere specific to go. That's why there's plenty of missions littered throughout the city that challenge you to refine your skills if you ever hope to complete them. 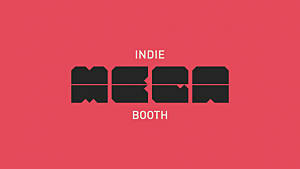 There are a plethora of missions to try your hand at. Whether you're racing, making deliveries, playing gameball, or spraypainting satalights for the resistance, there're plenty of ways to refine your skills in Hover. Nearly every mission offers a respectable challenge (one that may seem too hard at times), and you can even replay most of them after beating them to try for a better score. Unfortunately, some missions suffer from not being clear about what you're supposed to do or where you're supposed to go. For example, there's a quest chain in the first zone where you need to chase down and capture traitors. Instead of pointing the traitors out with the HUD's arrow, however, it simply points your camera in the general direction of the traitor after you're done talking with the quest giver. It took me ages to figure that out on my own, which is frustrating because the problem could have been circumvented entirely had they simply used the HUD elements they taught us to pay attention to throughout the rest of the time. No matter how confusing they can be, though, missions are certainly worth doing. Not only will you progress the story and gain experience, but you'll unlock new character DNA for completing certain quest chains. Each character specializes in certain things at the expense of their other stats, which can then be further augmented with skill chips to coax out a character's full potential and cover their weaknesses. Having a full team of specialized freerunners that you can swap between at any moment really transforms how you make your way around the vertical, open-world environment of ECP17. I'll be the first to admit that the "open-world" of Hover is a tad small. However, the levels were designed with verticality in mind, which makes the relatively minuscule stages feel gigantic. I still occasionally get lost in the larger stages after 40 hours, and getting lost isn't really something I do on the reg -- I'm the type that could walk you through every step of Dark Souls entirely from memory. Now be careful while traversing the streets. If the E-Cops spot you and catch up to you, they won't hesitate to dole out punishment. The first two offenses are warnings, and you'll be let off the hook at the nearest detention block. However, if you don't hack your name out of the system before you're caught for the third time, you'll be locked in a cell deep within the Prison, which you must then escape. While you're off avoiding the law and gallivanting around the city, you may run into other players if you happen to have your game set to Online. If your multiplayer options are set to Online, you'll automatically join a peer-to-peer server when you enter a map. You interact with players the same way you would on any other online game out there -- by bumping into them and saying hello through a chat box in the bottom-left corner of the HUD. If you see another player initiate a mission, you may ready up and challenge them, if you so wish. The only problem is that if you or the host has a spotty connection, the mission may end prematurely and without warning, giving you no prompt to try again and forcing you to trek all the way back to the quest giver should you wish to give it another go. Currently, the only way I know to fix this issue is to straight up switch to Solo mode in the multiplayer options. Admittedly, these are issues that may get patched out eventually -- but until they do, they significantly impact the Online Multiplayer experience to a point where I really don't want to deal with it sometimes. When it works, it works well, and really makes the game that much better. This is by far the most fun I've had playing a game for review yet. It may be simple in execution, but I couldn't help but chortle at the delightful time I was having running and jumping across the city. Hover: Revolt of Gamers lacks direction and flat-out refuses to hold your hand to the point where it doesn't explain anything aside from how to move your character. You have to figure out how races work and how to play gameball all on your own. If you're the type of person who likes this, you'll probably enjoy the heck out of this game. I definitely did. Interested? It's on Steam right now for just $20. Don't have a good PC? PlayStation 4, Xbox One, and Nintendo Switch versions are confirmed, but release dates are yet to be announced. So keep an eye out. If we managed to push you over the fence, be sure to check out our Beginner's Guide while you wait for your download to finish. 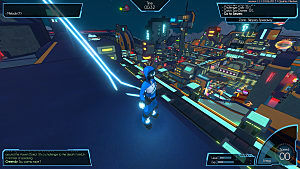 Let us know what you think of Fusty Games' and Midgar Studio's new parkour game in the comments below! Note: A copy of this game was provided by the publisher for the purposes of this review. 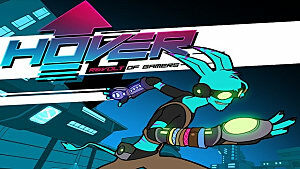 Hover: Revolt of Gamers may be a little unpolished, but bounding across ECP17 is the most fun I've had reviewing a game to date.